EGG demo packages are available for purchase for $795 (including tax). These EGGs have been used only at EGGtoberfest. Demo EGG Packages DO NOT include EGGtoberfest Tickets. EGGtoberfest Tickets must be purchased separately. You do not need an EGGtoberfest Ticket if you are arriving after 5:30 and only picking up a Demo EGG. EACH DEMO PACKAGE includes a Large Big Green Egg, intEGGrated Nest + Handler*, rEGGulator*, convEGGtor, Grill Gripper, Ash Tool, 1 Box of Fire Starters and a 10 lb. bag of Big Green Egg Lump Charcoal. EGG packages must be picked up on Saturday, October 13, 2018 between 5:30pm and 8:00pm. You cannot take your EGG before that time. You MUST go through the pick-up line to receive your EGG. You must bring receipt & identification for pick-up purposes. Remember, there will be a long line to pick up EGGs, so please be patient … or better yet, go enjoy the park and return between 7 and 8 to avoid long lines. Your Demo EGG ticket/receipt may be presented for free entrance to Stone Mountain Park on October 13. For free entrance, you must enter from the main gate off Hwy 78; if you already have an Annual Stone Mountain pass you can enter through any gate and proceed to the EGGtoberfest venues. Friday Night Meet and Greet – Sold out! Advance ticketing is required for all EGGtoberfest activities – there will be NO walk-up tickets available. The Meet and Greet Party at the Evergreen Marriott Conference Resort (click here for directions) is a festive evening to catch up with old friends and make new ones. Join us for hors d’oeuvres, craft beer, wine and soft drinks (cash bar available for other beverages). If you are planning on consuming alcoholic beverages, Marriott policy requires that over 21 wristbands be issued. A photo ID will be required for all guests requesting an over 21 wristband for all EGGtoberfest events. Your Meet and Greet ticket must be presented for free entrance to Stone Mountain Park on October 12. For free entrance, you must enter from the main gate off Hwy 78; if you already have an Annual Stone Mountain pass you can enter through any gate and proceed to the EGGtoberfest venues. EGGtoberfest Cooks Registration – Sold out! Advance registration is required for all EGGtoberfest activities – there will be NO walk-up tickets available. Registration to cook on EGGs: Each registration requires a $50 refundable deposit for (1) demo EGG to cook on for (2) EGGhead cooks. We realize that registration for EGGtoberfest happens well before the event itself and that, in-between early August and October 13th, well… life happens. 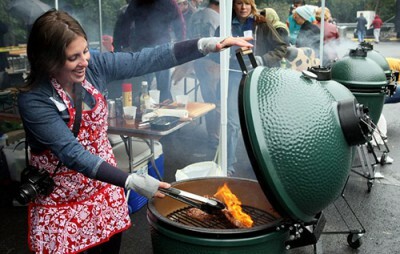 People’s schedules change and sadly, they aren’t able to cook at EGGtoberfest after all. Should that happen to you please contact our ticketing partner, Xorbia, before September 25th for a full refund of your deposit. In doing so, you will have made a fellow EGGhead that takes your spot very happy! Generators are not permitted. No vending please. Registration for cooks is required — space is limited! There will be a special check-in location for cooks on Friday at the Meet and Greet from 5:30 – 7:30 pm and on Saturday morning from 8:00am to 10:00 am to allow for cook spot assignments — please look for the EGGhead Cooks Registration signs when entering the event areas. Personal coolers are permitted. NO GLASS BOTTLES anywhere in the EGGtoberfest venue. 3:00pm – All of the EGGs will be shut down to facilitate cooling and to get them ready for transport home with their new owners. As in previous years, our generous EGGtoberfest Cooks provide food and cook a variety of dishes for our guests to enjoy. Two (2) people may register to cook on one (1) EGG. Cooks will check in at a special registration area; please look for signs when you arrive. Registered Cooks may select their EGGtoberfest cooking space location during the Meet and Greet event on Friday night or on-site Saturday morning. No unloading will be permitted before 8:30am on Saturday. All vehicles must be out of the event area by no later than 10:00 am. Due to Stone Mountain Park safety regulations, no vehicles will be allowed into the cooking area until 5:00 pm. Cooks are requested to stay at the event until 3:00 pm. Assistance will be available for loading and exiting the venue after 3:00 pm on a first come, first served basis. PLEASE NOTE: There are limited Cooks’ Tickets available so due to high demand we ask that if you are registered and cannot make the event please contact us as early as possible so that your Cooks’ Ticket can be reassigned. Each cooking space will contain one EGG, a table and two chairs. If you want to bring a tent, please note that only 10×10 or smaller tents will be permitted. Generators and vending of any kind are not permitted. Please do not move EGGs, tables or chairs into another space; all EGGs will be reserved for registered cooks on Saturday. As in the past, Big Green Egg reserves the right to group single cooks together to allow for more cooks to enjoy the experience. COOKS’ INFORMATION: If you are planning on consuming alcoholic beverages, Marriott policy requires that over 21 wristbands be issued. A photo ID will be required for all guests requesting an over 21 wristband for all EGGtoberfest events. Your EGGtoberfest Cooks’ Ticket must be presented for free entrance to Stone Mountain Park on October 13. For free entrance, you must enter from the main gate off Hwy 78; if you already have an Annual Stone Mountain pass, you can enter through any gate and proceed to the EGGtoberfest venues. COOKS: Don’t forget to collect votes for the People’s Choice Favorite EGGhead Cook Team Award. Votes must be turned in at the Cooks’ deposit refund tent no later than 2:30pm. The People’s Choice Award will be announced on the music stage at 3:00pm. 21st Annual EGGtoberfest General Admission – Sold out! EGGtoberfest is a day dedicated to celebrating the EGGhead community and innovative EGGhead chefs! Check out the creative recipes, learn new techniques from an EGGspert, and sample foods cooked by seasoned EGGtoberfest alumni — as well as a few brave newcomers. Enjoy EGG demos, listen to live music, or spend a day at the Park. The on-site Big Green Egg store will be the biggest on the planet and will be open all day, cool drinks and tasty craft beer will help keep you refreshed. Cooking on the EGGs ends by 3:00 pm to allow for cooling. Your Saturday registration includes food sampling, beverages (five drink coupons per ticketed attendee; may be redeemed for soft drinks, water or beer as supplies last. Personal coolers are allowed, but NO glass containers are allowed), commemorative T-shirt and a special gift! T-shirts will be available for all ticketed guests in sizes S-3XL; specific sizes available while supplies last. If you are planning on consuming alcoholic beverages, Marriott policy requires that over 21 wristbands be issued. A photo ID will be required for all guests requesting an over 21 wristband for all EGGtoberfest events. Your EGGtoberfest ticket may be presented for free entrance to Stone Mountain Park on October 13. For free entrance, you must enter from the main gate off Hwy 78; if you already have an Annual Stone Mountain pass you can enter through any gate and proceed to the EGGtoberfest venues. All events are outdoors; please bring the appropriate weather gear. This Pass is a Non Transferable and Revocable License and has been issued for the The holder of this pass acknowledges and expressly assumes all risk at or incidental to the event, whether occurring prior to, during or subsequent to the actual event, and agrees that all event participants including Big Green Egg, Inc. (BGE), Silver Dollar City Stone Mountain Park, Inc. (SMP) and all shareholders, directors, employees and agents of each are hereby released from any and all claims including claims of negligence arising from the event or from holders participation in any activities at the event. The holder of this pass grants BGE and SMP the right to use the holder’s image and/or likeness in any live or recorded video display, photography or other transmission or reproduction of the event, including rights of publicity. Possession and use of this pass constitutes acceptance of and agreement Authorized Entry EGGtoberfest 2018 sole purpose of providing access to the 2018 EGGtoberfest event. All bags and coolers are subject to inspection. ®COPYRIGHT BIG GREEN EGG. Big Green Egg® , EGG®, EGGspert®, EGGhead®, convEGGtor®, rEGGulator™, and EGGtoberfest® are Registered Trademarks of Big Green Egg Inc.